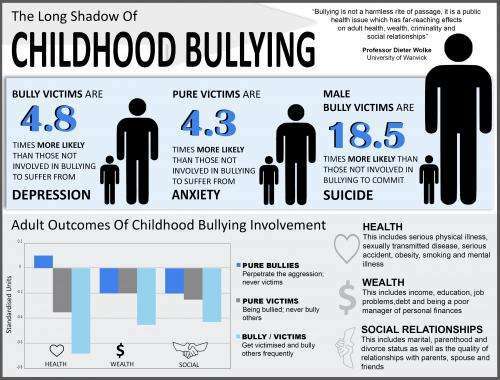 "Bullying is not a harmless rite of passage, it is a public health issue which has far-reaching effects on adult health, wealth, criminality and social relationships." That is the warning from Professor Dieter Wolke, of the University of Warwick, who will present the findings of his research to the House of Commons today. It has long been acknowledged that bullying at a young age presents a problem for schools, parents and public policy makers alike. Though children spend more time with their peers than their parents, there is relatively little work done on understanding the impact of these interactions on their life beyond school. Having published a number of articles that highlights the extent to which the risk of health, wealth and social problems in adulthood are heightened by exposure to bullying, Professor Wolke is keen to dispel the myth that bullying is a 'rite of passage'. Professor Wolke said, "We need to change this mindset and acknowledge this as a serious problem for both the individual and the country as a whole; the effects are long-lasting and significant." Professor Wolke, alongside Dr William E. Copeland of Duke University Medical Center, led the team, looking beyond the study of victims and investigating the impact on all those effected; the victims, the bullies themselves, and those who fall into both categories; 'bully-victims'. The numbers, as presented in our infographic, further demonstrate the scale of the problem. 'Bully-victims' were 4.8 times more likely to suffer from depression in adulthood than those who weren't exposed to bullying. Male victims of bullying were 18.5 times more likely to commit suicide than those who hadn't experienced bullying. Professor Wolke explained, "The results show that bully-victims are perhaps the most vulnerable group of all. This group may turn to bullying after being victims of bullying themselves as they lack the emotional regulation, or the support, required to cope with it." The health, wealth and social implications also make for worrying reading. When compared to those who had no exposure to bullying in the schoolyard, all groups (bullies, victims or bully-victims) were more than twice as likely to have difficulty in keeping a job, or commit to saving, and as such displayed a higher propensity for being impoverished in young adulthood. Equally, all groups showed signs of having difficulty forming social relationships, particularly when it came to maintaining long term friendships or good ties with parents in adulthood. Professor Wolke added, "This just goes to show how bullying can spread when left untreated. Some interventions are already available in schools but new tools are needed to help health professionals to identify, monitor and deal with the ill-effects of bullying. The challenge we face now is committing the time and resource to these interventions to try and put an end to bullying." This work was supported by the Economic and Social Research Council (ESRC) in the UK and the National Institute of Mental Health, the National Institute on Drug Abuse, the Brain and Behavior Research Foundation and the William T. Grant Foundation in the USA. Please see the full article for additional information, including other authors, author contributions and affiliations, financial disclosures, funding and support, etc. The research assessed 1,420 participants four to six times between the ages of 9 and 16 years and adult outcomes between 24-26 years of age.